How do you solve a problem like Medivh? The trouble with Heroes of the Storm's unusual new character. Heroes of the Storm loves to try out strange things with its characters. Cho’Gall is the embodiment of ‘two heads are better than one’ and has two players controlling one character, The Lost Vikings did the reverse and had one player controlling three characters, and now Medivh is an almost entirely utility-focused hero, with an intentionally pathetic amount of damage at his disposal. Hot on the heels of his appearance in Warcraft: The Beginning, Medivh is the newest hero in Heroes of the Storm. He’s got an ability that shields an ally, preventing all damage for 1.5 seconds. He has another ability that creates two portals connecting great distances, and an ultimate that can polymorph heroes indefinitely (theoretically). There’s no other hero who can even compare to Medivh’s utility. On paper. But despite being best-in-class for utility, Medivh hasn’t exactly made a mark on Heroes of the Storm. In fact, according to fan-run site hotslogs.com, Medivh has a pathetic 26% winrate across all skill levels in the game’s ranked mode. That 26% winrate is a little skewed, though: it includes both the best and the worst of players. All of the heroes classed as “Very Hard”, of which Medivh is the third, suffer from a low winrate when measured in the lower leagues. At the highest ranks of play, Master and Diamond, his winrate does jump up to 31.2%, and if you move to Team League, Heroes of the Storm’s ranked gameplay mode for teams of five to play with each other, his winrate is 41.8% across all skill levels. It’s still the lowest of all heroes, though, but that’s not a small difference: Medivh is winning around 15% more games in Team League than Hero League, and a good 5% more when it’s the best players giving him a shot. He’s skewed to one set of Heroes of the Storm’s audience: the best of the organised players. That’s not exactly a surprise. His abilities are made to supplement his team, so his effectiveness is reliant on working together. 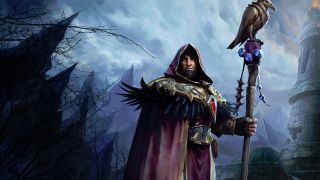 Some heroes are made to fit a niche, to be useful in very specific scenarios, but Medivh isn’t just filling a niche: he’s filling a specific spot for a very specific subset of players. This isn’t the first example of this trend in Heroes of the Storm, either. Muradin, one of the game’s earliest heroes, has undergone change after change, nerf after nerf, just to bring him in line with other heroes. Because of this, he’s now one heroes with the lowest winrates, second only to Medivh as of right now. He’s still a hotly contested hero in professional and high-ranking play, however: all professional tournaments feature him without fail. He’s a massive meat wall with a good chunk of sustain, an easy way to escape most situations, and, most importantly, a 1.5 second stun that’s relatively easy to land. It means he can combo with other heroes incredibly easily, if they’re paying attention, and even if he doesn’t, he still works as an incredibly annoying barrier. He’s pretty versatile, and is the catalyst that brings many team compositions together. At Dreamhack All-Stars just recently, Renovatio got an early lead against Negative Synergy simply by using Muradin’s stun to easily land Kael’thas’ Gravity Lapse. But because of how strong he is in professional play, he has to be dragged back a bit. His ultimate ability “Avatar” no longer stuns, and a lot of his talents have been tweaked to nerf him over the past patches. These changes have hurt his success in your average casual game, though, meaning he’s just no longer a strong pick for the fact majority of players: those who aren’t in the top percentiles. Muradin certainly isn’t a lost cause, and it’s clear that Blizzard want to address this matter. In May, for example, a patch that focused on reducing the duration of stuns in order to make the process of combining stuns one after another a little less horrendous if you’re on the receiving end made Muradin just a little better. Medivh, on the other hand, is a unique case. His entire identity as a hero is based around the ability to work with his team in a way that The Lost Vikings or Abathur aren’t. While both of them rely on their team to be used to their maximum potential, they very much have a purpose when played solo, and can have an effect on the game without the communication skills of a professional team. What good is it to set up a pair of portals to attack the enemy if your allies aren’t sure why they’re there? Are they for Medivh to get in, shield someone, and get out? Is the whole team meant to get aggressive? Is it someone’s escape route? Slowly, people will get used to answering these questions and will develop the game sense to know what their best options are, but it will never compare to Medivh’s usefulness in a team of organised players. Medivh is a fascinating character, and a wonderful example of why Heroes of the Storm excels as a MOBA: every character is unique in places other games in the genre don’t dare tread. He’s stuck in a corner, however: add to his damage or survivability, and Blizzard would be making him even stronger in the moments where he does excel in professional play. If they then make his utility a little less effective to bring him back in line, they’d be cutting away at the very thing that makes Medivh distinctive. He’s a playmaker, and Blizzard have given themselves the challenge of creating a playmaker that can work at all levels of play. Someone that still works in the hands of five strangers and also has the ability to bring about the big moments that make esports so enjoyable. Until they find that balance, though, he’ll be a hero that alienates the casual crowd. A hero who is solely made for the pros.